Looking for the perfect outdoor entertaining house? This does not disappoint. Two story brick on basement with hardwood floors and plantation shutters and dual staircases. Gourmet kitchen with custom lighted cabinetry, six burner cooktop, built-in Bosch stainless steel fridge, huge island, icemaker, and china cabinet. Master bedroom with his/her closets and master bath with double vanities and oversized shower. Large backyard has multi level decks, gazebo, and firepit. 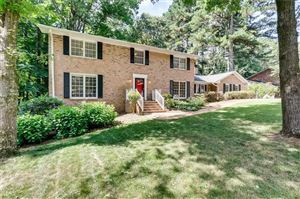 Quiet neighborhood and street is on a triple cul de sac.